This St. Patrick’s Day, forget the green hats and cheap green beer and celebrate in style instead. 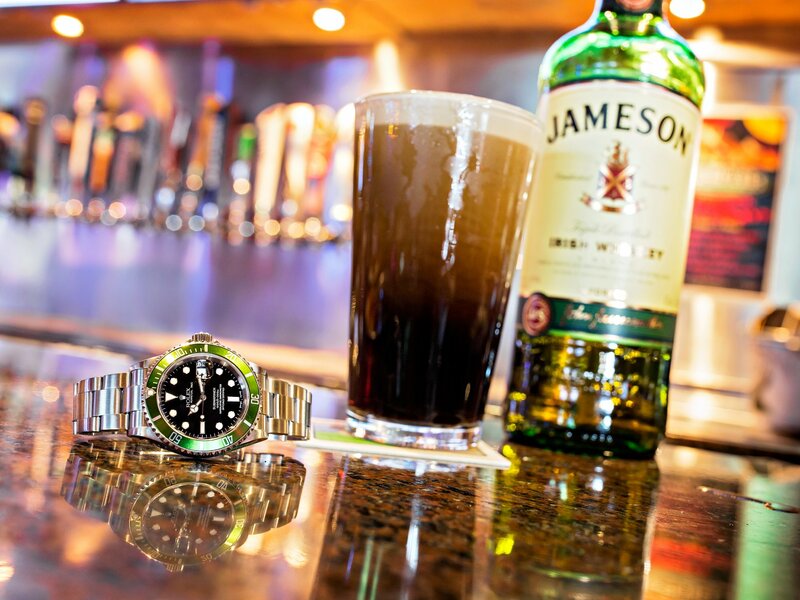 May we suggest a green Rolex and a glass of real Irish whiskey or stout? 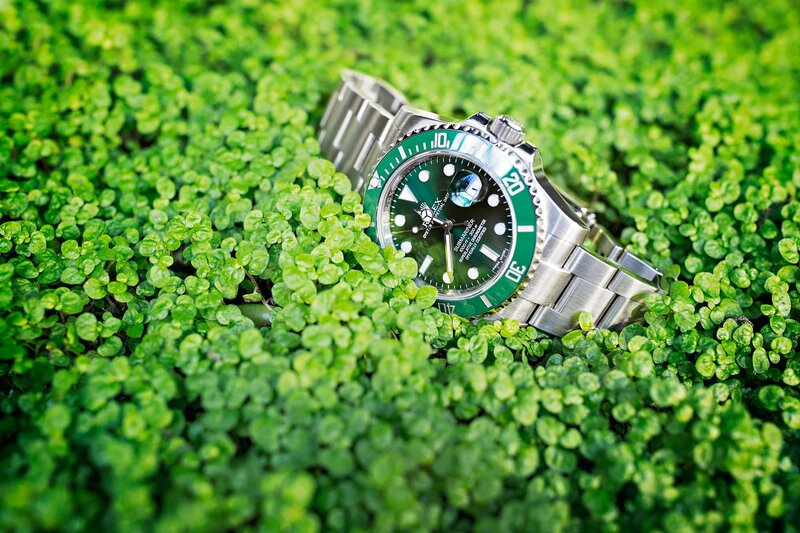 We have the watches covered, so read on to discover some glorious green Rolex watches—our version of a pot of gold. Don’t get pinched. Be sure to wear green this St. Patrick’s Day. Nicknamed the “Kermit”, the Rolex Submariner ref. 16610 made its debut in 2004 to commemorate the 50th anniversary of the iconic dive watch. Although the luxurious model has since been discontinued, the Submariner ref. 16610LV remains a popular Rolex model. Its stainless steel 40mm Oyster case is home to a green diver’s bezel, while the dial is black. On the dial, there are the characteristic Mercedes-style center hands, in addition to the larger lume plots for maximum legibility. Beating within the case is the Rolex Caliber 3135—water resistant to 1,000 feet—that powers both the time and the date functions. The “Kermit” is a popular watch. This beauty has a 40mm case. If you love green Rolex watches with catchy nicknames, then take a look at the Submariner ref. 116610LV “Hulk”. It probably got its moniker for being bigger, bolder, and more brash than its predecessor. Although the Sub ref. 11610LV sports the same 40mm sized Oyster case, it certainly wears bigger and bulkier thanks to its slight redesign. Furthermore, this particular Submariner has the highly coveted ceramic bezel. And that bright green bezel looks exceptionally great next to the matching green dial. The stainless steel body and green face of the Rolex Submariner ref. 116610LV is an unbeatable combo. The “Hulk” received its nickname from… Can you guess? Moving away from the water to the laboratory, we now delve into the Rolex Milgauss ref. 116400GV. 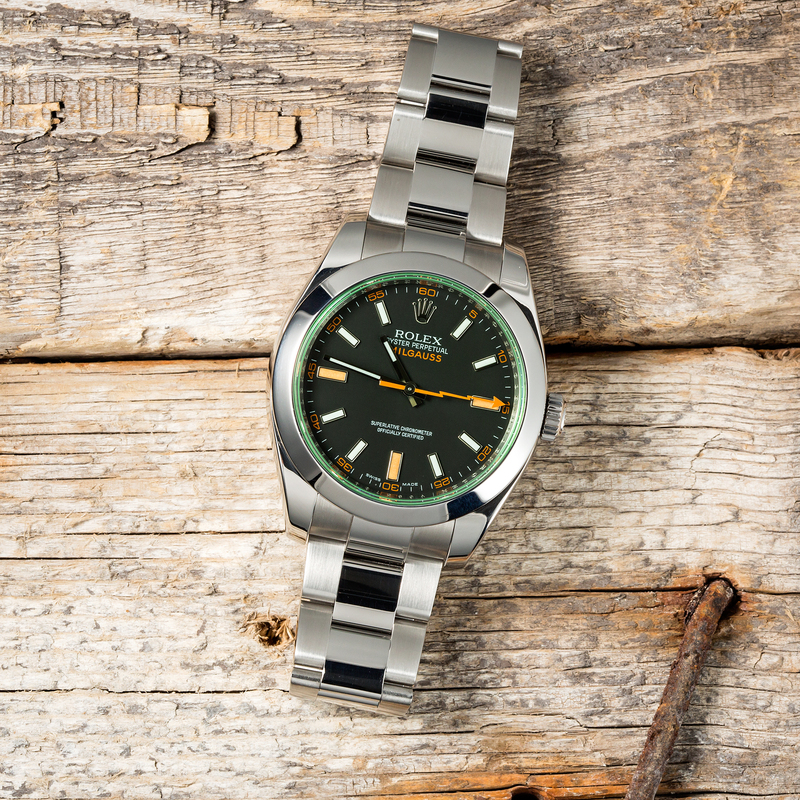 The Milgauss was produced for the scientific community who found themselves in environments with high magnetic fields. Thus, Rolex presented the Milgauss watch that could withstand 1,000 gauss. Fast forward to today and the Milgauss ref. 116400GV is a subtle interpretation of green Rolex watches. The green sapphire crystal atop the 40mm stainless steel case emits a slight futuristic glow—a perfect complement to the quirky orange lightning bolt shaped seconds hand. The Milgauss was produced with scientists in mind in order to provide accurate time. In contrast to the sportier models listed above, this particular Datejust II ref. 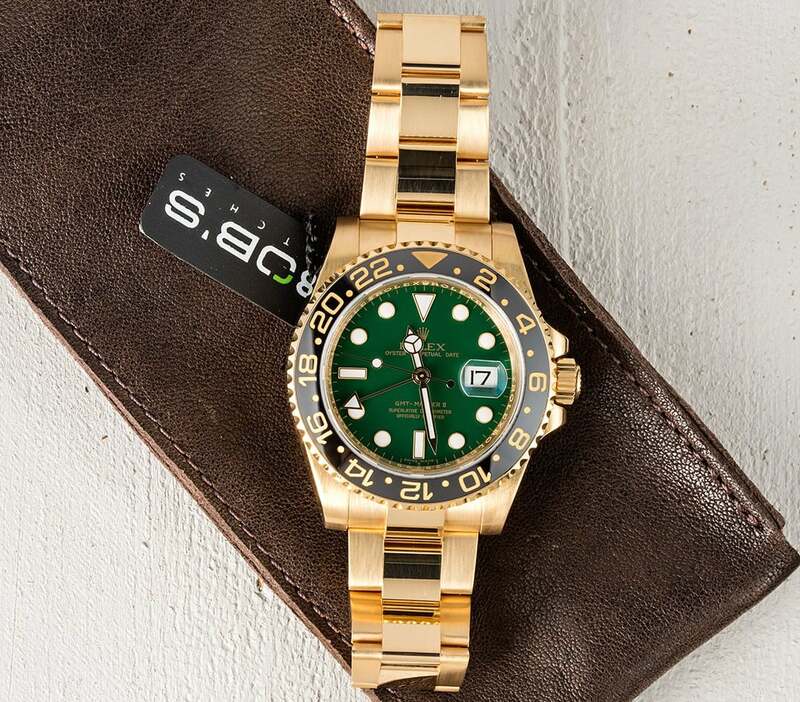 116333 is more discreet when it comes to green Rolex watches. The green Roman numerals on the dial is a nice touch to the two-tone yellow gold and stainless steel Datejust II. Additionally, the yellow gold fluted bezel elevates the dressiness of this Rolex. With a case that measures a more robust 41mm compared to the more traditional Datejust models, the Datejust II is a fantastic modern interpretation of the classic Rolex dress watch. Although the Datejust II has been replaced by the new Datejust 40 collection, there are still plenty of models—such as this one—that are well sought-after. A Rolex Datejust II Wimbledon 116333 has green hour markers. For the most luxurious choice among green Rolex watches, it doesn’t get better than the GMT-Master II ref. 116718LN. Not only was the GMT-Master II ref. 116718LN with the green dial manufactured to celebrate the 50th anniversary of the legendary GMT-Master pilot’s watch, but it was also the first Rolex to sport the Cerachrom ceramic bezel. 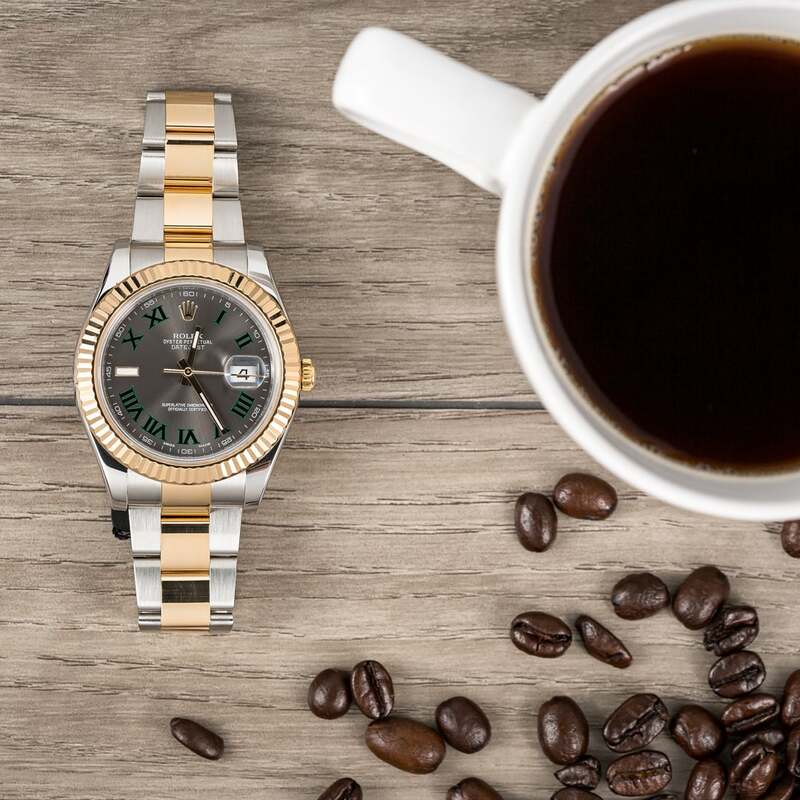 Prized for its attractiveness, as well as, its resistance to scratches and fading, the Rolex ceramic bezel is a popular choice among the brand’s modern sports watches. Looking deeper into this GMT-Master II’s details, it is not wonder why this watch is seen on every collector’s wish list. With the GMT-Master II ref. 116718LN’s full 18k yellow gold construction, who needs a pot of gold at the end of the rainbow anyway? Anniversary Rolex GMT-Master II ref. 116718LN has a green face, perfect for St. Patty. 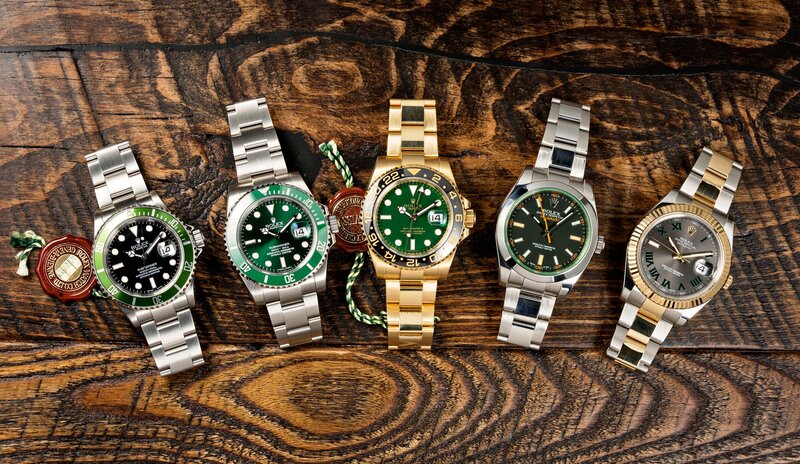 Are you a fan of green Rolex watches, and if so, which are your favorites? Do you own any of them or perhaps searching for one to add to your collection? Let us know in the comment section below.